Apple has released an update to Keynote Remote iPhone app. The app allows you to control Keynote slides using iOS devices. Optimized for the Retina display, including support for high-resolution slides. Support for iOS 4 multitasking. Improved handling of alerts (such as push notifications, text messages) received while controlling a presentation. Improved handling of loss of connection with Keynote â€™09. Fixed networking issues, including recognizing a new Wi-Fi network if it was connected after launching Keynote Remote. 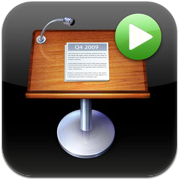 Keynote Remote is sold for $0.99 at the App Store.